SERVING THE DALLAS METROPLEX SINCE 2006! 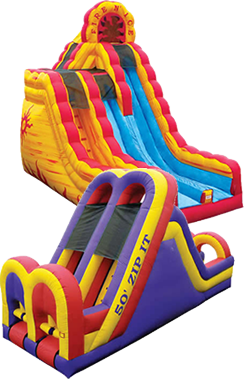 Bounce ‘N’ More, LLC is a family owned and operated party rental business serving Plano. We provide party rentals to the Plano area for any kids party, corporate event, church function, fundraiser or gathering with Inflatable Bounce Houses, Water Slides, Combo rentals, Concession Equipment and Frozen Drink Machines. Our mission is to provide quality, safe party rental equipment in Plano, TX that is clean and sanitized, with the best customer service, on-time delivery, and affordable pricing. Candy Land Bounce House. The children absolutely loved it. It was hard to keep track of time to let other’s in. even harder to stop those inside for others to play… they just wouldn’t come out!! Wrecking Ball. The best bounce house ever. everyone enjoyed it! even the older adults!! DEFINITELY a must have for the next event! © 2019 Bounce 'N' More. All Rights Reserved. Back to top | © 2019 Bounce 'N' More. All Rights Reserved.